Special thanks to Sarah Harper, PhD candidate at the University of British Columbia, for her expertise and guidance. The definition of “fishing” is often limited to refer to those individuals who go out to sea on fishing vessels and use specialized gear to capture fish. As a result, this narrow outlook of “fishing” generally excludes women from the definition. If we expand our scope of the definition of “fishing,” and include the whole fish value chain, women are thought to make up 47% of the global fishing workforce. However, in many cases, men and women take on different roles and operate in different spaces with many of these roles being overlooked in fisheries policy and management. 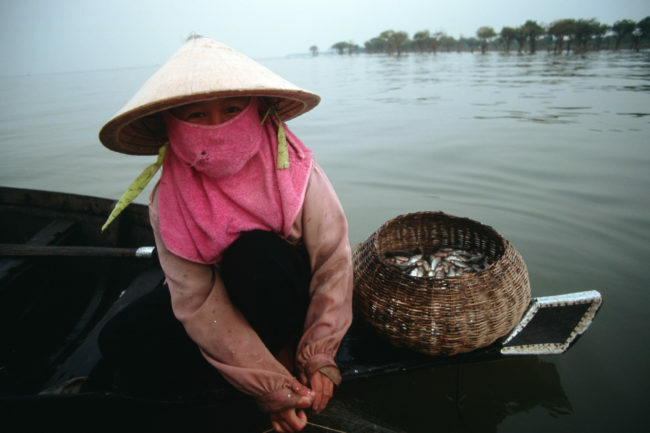 Women’s contributions to fisheries are often overlooked, under-estimated, and/or under-valued. While in many contexts, it is primarily men who go out to sea to catch fish, women participate in catch activities such as gleaning, the collection of invertebrates (including crabs, shellfish, octopus, clams, eels, and sea cucumbers) and small fish at shore. 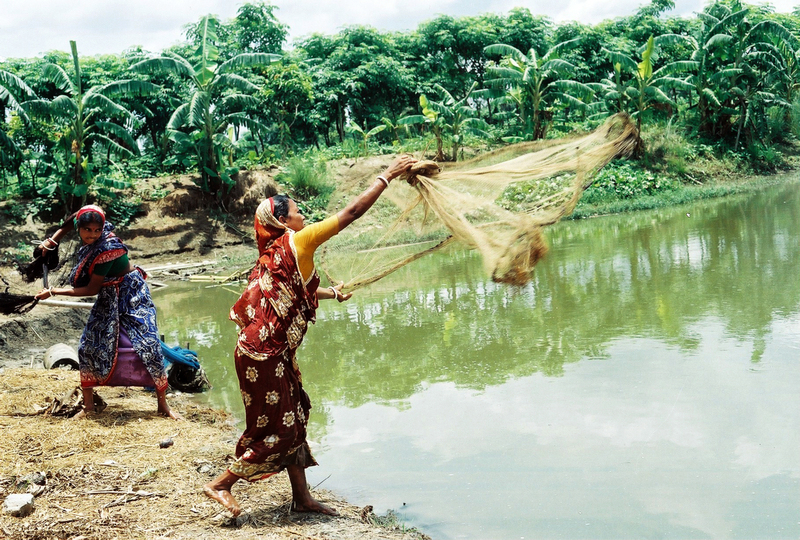 Pre-harvest activities commonly undertaken by women include the mending of nets, gathering of bait, and preparation of food for fishing trips. Post-harvest activities, which are often dominated by women, include carrying fish from shore, sorting and cleaning fish, processing activities (drying, freezing, smoking, and fermenting), marketing, sales, and trades. 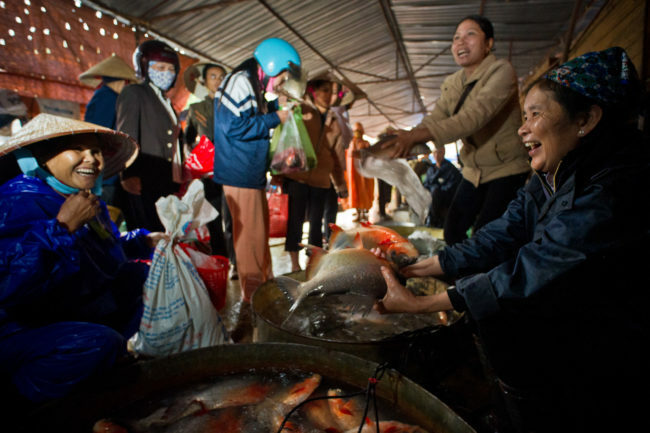 As traders of fish, women build patron-client relations that provide these women with unique knowledge regarding upcoming seafood demands and thus exploitation patterns over time. Women also support fishing operations by managing household activities such as cleaning the home, feeding the family, and taking care of children while husbands are away on fishing trips. The labor contributions by women in the fisheries sector often fall into the category of informal or unpaid work, yet these activities have important implications for fishing families, communities, and economies. However, these activities are often not captured by National accounting systems, which tend not to count subsistence activities and reproductive (i.e. care work). Arguably, it is these very contributions that make the fishing industry viable and allow fishing communities to survive. Since women’s fishing activities often differ from those of men, women may have specialized knowledge about the species they catch and process, and the habitats they work in, knowledge that is valuable for understanding ecosystem change and for developing more sustainable fishing practices. Additionally,invertebrate fisheries, often dominated by women and children, contribute significantly to local food and nutritional security in regions where supplies of nutrient dense foods are limited or unaffordable to many. A case study of Senegal, West Africa indicates that 90% of the country’s fisheries’ seafood processors are women, valued at $30.5 million 2015 USD. In The Philippines, the roles of women in fisheries through developing family livelihoods and selling fish in villages are acknowledged. In Palau, dataindicates that 19.9% of subsistence fishers are women. Although there is increasing recognition of women’s contribution to fisheries operations in many countries, the capacities of these women to contribute to natural resource management is lacking at the industry level. Women are clearly key actors in fisheries, yet they represent less than 5% of fisheries governing bodies. Lack of female participation in fisheries decision-making processes hinders efforts to achieve democratization and devalues the economic and social benefits that women in fisheries provide. In addition to lacking voices in decision- and policy-making roles, women in fisheries also face other pressing issues. Generally, females have less education opportunities than men and are plagued by higher rates of illiteracy. A study of a fishing community in Sierra Leone found that 14% of women had received formal education while 22% of men had; similarly, 10% of women could read, write, and speak English, while 19% of men could. This discrepancy in education means that women in fisheries have no alternative livelihood options. Although active contributors to fishery operations, women face social and economic constraints that prevent them from being equal participants in the fisheries sector and from deriving benefits from fisheries resources. Image: “Small-scale fisheries, Tonle Sap, Cambodia” by Dominyk Lever, 2004, CC BY-NC-ND 2.0. Breaking down the barriers that prevent women from achieving gender equality in fisheries communities is necessary in the pursuit of all facets of sustainable development. Image: “Loan 1564: Rural Infrastructure Sector Project in Viet Nam” by Asian Development Bank, CC BY-NC-ND 2.0. Since women lack alternative livelihood opportunities, they are especially vulnerable to changes in fish stocks (that may ensue from climate change). Most women in fishing communities lack access to capital, resources, and information, thus placing them in a significantly economically disadvantaged position in comparison to the men. In processing facilities, a study indicated that women get paid less for the same jobs, leading to income disparities between genders, which further marginalizes women economically. Women in fishing communities face social constraints, such as a lack of governmental connections, which further exacerbate gender inequalities by limiting women’s capacity to influence management and policies. Highlighting the contributions by women in fisheries and incorporating women into fisheries management processes are critical to efforts toward a more equitable and just society, and are in line with global initiatives to promote the sustainable use of the ocean and other natural resources while also promoting gender equality. Although there has been some progress in addressing gender inequalities in fisheries, further research and action is urgently needed. Braela is a BSc candidate at the University of British Columbia studying environmental science. Working as a work-learn student with the Nereus Program, she has received the opportunity to learn more about her keen interests in oceanography, marine conservation, and the integration of the physical and social sciences of the environment.